The social partners in the Nordic region have to adapt the Nordic labour market model to fit the sharing economy, driverless forklifts and other new labour market trends. If they don’t, others will, a Danish expert warns. The Danish government and the social partners have approached the task by establishing a new body: “The Disruption Council”. The Coop supermarket chain transports many tonnes of goods every day, and some are being moved around by driverless forklift trucks. Coop’s headquarters in Albertslund near Copenhagen got a visit from Prime Minister Lars Løkke Rasmussen (The Liberal Party Venstre) and several other members from the government’s new Disruption Council as it met for the first time on 15 May 2017. Disruption has become a buzzword in Denmark for the changes brought on by technology. The Disruption Council consists of the Prime Minister and a wide selection of government ministers, the social partners, business leaders and experts. The Council’s task is to find out how many new trends like digitalisation, robots and artificial intelligence can make Denmark richer and improve welfare – and at the same time find out how the Danes can safely face a future where many traditional jobs will disappear, including the jobs of forklift truck drivers. “This technology brings a lot of good things. We avoid people getting worn out from monotonous repetitive movements, but of course when some working tasks disappear we need to find new ones. If you have trained to drive a forklift truck, and that truck suddenly becomes driverless, you have to do something else. You need further training to be able to perform a different working task,” said the Prime Minister. Education, further training and retraining are also keywords in the new booklet ‘Forwards into the future’, which the Prime Minister has published to coincide with the Disruption Council’s first meeting. 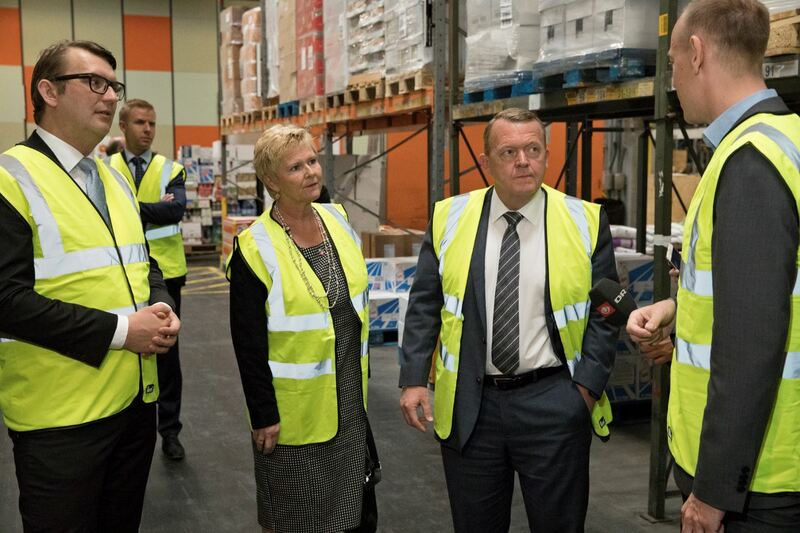 The Minister for Employment, Troels Lund Poulsen (The Liberal Party Venstre) and the President of LO-Denmark Lizette Risgaard also accompanied the Prime Minster during his visit at Coop. The LO President also sits on the Disruption Council and has written several opinion pieces about how she does not fear disruption will lead to technological mass unemployment. A Danish expert on the sharing economy and digitalisation, Anna Ilsøe, also predicts that the Danish and Nordic labour market models will come under increased pressure because of new trends. She is an associate professor and PhD at the Employment Relations Research Centre FAOS at the University of Copenhagen, and currently heads two research projects – one about the digitalisation of service work, the other about digital platforms. She expects in the future more people will have part time jobs, be paid per gig or work both part time and do fee-based work on the side. The Nordic model needs to adapt to this, as it is now based on having a majority of the workforce working full time and saving for their retirement through a negotiated labour market pension scheme, while relying on state support during times of ill health or for child care. “If the social partners do not develop solutions themselves here, private players will. So we will for instance see insurance companies offer citizens products that will make their lives more secure,” says Anna Ilsøe. The Danish Prime Minister Lars Løkke Rasmussen (leaning forward in the middle in the picture above) watches a demonstration of Coop's driverless forklift trucks. The internet of things – machines, units etc. able to communicate with each other and automatically exchange data. A fridge can for instance order milk to be delivered in the afternoon if it registered that the last litre disappeared at breakfast. Artificial intelligence and machine learning – often used in relation with machines that are able to ‘learn’. This is an area still developing, but one which offers wide-ranging opportunities and involves solving non-routine tasks, e.g. translation of languages and the recognition of hidden and complicated patterns and connections in data. Augmented Reality/Virtual Reality – technology joining computer generated images with images from the real world, or digital “glasses” which allow the user to feel like she is in a different, virtual room. Can be used in the entertainment industry, for repairing machines or in construction, where an engineer can walk around inside a virtual model of new houses to look for faults in the construction. Quantum computers – still being developed. These will have huge computing power and the ability to deal with very complicated algorithms, which can improve things like encryption. Intelligent robots – can carry out increasingly complicated tasks in industry production very precisely, including movements instructed by sensors. Intelligent robots have been used in industry for many years. Korea, Japan and Germany have the highest number of industry robots per employee. Denmark is number five in the world, which is high up considering the country has no automotive industry. 3D-printing – creating a three-dimensional object using software. Not widely used in Denmark yet. In future it could allow private individuals to print products they have bought online. It could also considerably reduce production costs in certain areas. Self-driving cars – could lead to full automation of driving. Today cars are being equipped with semi-automatic software, while fully automatic cars are still only in trial. Could lead to safer traffic, better use of road capacity and faster transport. Cloud computing (“the cloud”) – used to increase computing or data power. Is being used by 42 percent of Danish companies. Cloud computing can provide far more flexible and scalable computer capacity for companies, which often buy computing power through monthly subscriptions. Block-chain – a joint digital trust, communication and sharing platform which is a kind of advanced database. Block-chain technology includes digital currencies like bitcoin. Could be used in future for money transfers for people in countries where there is little access to bank accounts, for instance. Big data analysis – dealing with large amounts of data from built-in sensors in various products, geolocation, social media and other online behaviour etc.